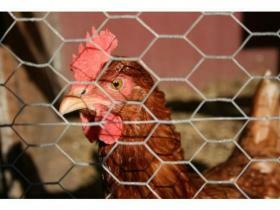 File photo - This Ypsilanti chicken's photo was taken on resident Peter Thomason's farm last summer. Now, city residents can apply to own up to four hens in the city. Jul. 22, 2009 · 4:39 a.m.
Urban farming hopefuls will now have the chance to own up to four chickens in the city of Ypsilanti. City Council unanimously passed an ordinance establishing a permit process to keep the animals Tuesday night. Mayor Pro-tem Trudy Swanson, D-Ward 1, and Councilmember Michael Bodary, D-Ward 2 were absent from the meeting. Both Swanson and Bodary had opposed the measure on its first reading earlier this month. Councilmember Lois Richardson, D-Ward 1, had as well, but she reversed her decision Tuesday. The ordinance, which was amended, allows city residents to apply for a permit to keep four hens in a coop in their back yard. The principal use of the permit must be for one or two-family units. It does not allow for the keeping of roosters, and does not permit slaughtering on property. Councilmember Peter Murdock, D-Ward 3, proposed the amendment that was unanimously passed. The amendment stipulates that the chickens must be kept in a structure at least 20 feet from a neighboring dwelling, unless the neighbor provides written consent. Additionally, the amendment removed the $10 fee, which will likely be put on the city’s existing fee structure, allowing City Council the ability to change the fee without having to post another ordinance. Finally, Tuesday night’s amendment sets permits to expire in two years, with the option for renewal. However, the ordinance sunsets in one year, requiring City Council the revisit the issue in 2010. Previously, the ordinance would have sunset after a year, but existing permits would have been grandfathered in indefinitely. Five audience members, including an Ann Arbor resident, spoke in favor of the ordinance. Four audience members, including former mayor Cheryl Farmer, spoke out against it. Several Council members said they had been overwhelmed by residents’ input after the City Council meeting earlier this month. “I’ve gotten more calls on hens than on any other issue we’ve faced,” Richardson said. Thomason, an Ypsilanti resident, has been involved in a lawsuit with the city after he began keeping dozens of chickens and rabbits, as well as several goats, on his property. At the meeting, he said it was a separate issue, as he is attempting to operate an actual farm inside the city. Nickels said chickens would likely have little impact on ordinance enforcement, which was Farmer’s main argument, as ordinance enforcers have to maintain the city’s current ban on chickens now. He said if people were interesting in breaking city ordinances as Thomason has, they could have already done so, at the expense of fees and other penalties. From his research, Nickels said the diseases chickens carry are similar to those that are carried by other birds that live in the city. He said the attraction of predators would be curtailed the requirement of a chicken coop. At the end of the meeting, Ypsilanti resident Kenneth Harrison expressed his “disappointment” with City Council for their adoption of ordinance, especially his representation on City Council. He said Richardson had “flip-flopped” on the issue. Harrison hinted at a recall effort for those City Council members who voted to support the ordinance.